08/Jun/2016 Posted By Blue Pi no comments. In other words, a CMS tool allows companies to manage their website even when they have no technical knowledge, experience with HTML or website design. Often there are delays getting new content online, the site stagnates and the clients get to see the outdated information. This is the reason why many companies these days are turning to CMS. It helps them to keep their website content as up to date as they like. Also, it reduces the time required to publish, allowing companies to get their content online faster. CMS, thus presents a solid case in favor of itself and by far one of the best investment for a website and a business. A CMS offers power along with simplicity so the companies instead of getting bogged by the technicalities of managing their websites can concentrate on improving their business. Here are six key benefits of using a CMS to run your business website. Generally, not every user has the same comfort level with technology. 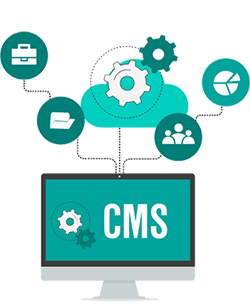 Keeping in mind this fact, CMS has been developed with very basic functionalities. The basic features like writing and publishing content, and slightly advanced ones of adding media etc are not that difficult to grasp for anyone. In fact, it saves a lot of time training as anyone who can use word-processing software can use a CMS for the basic functions. For a website to function successfully, it is likely that there are many people who can have inputs into a website, from those who add product pages to those who produce blog posts for the content marketing efforts. A CMS enables to manage roles and publishing permissions for all these users so that only those who are allowed can publish content. CMS provides companies with an overall view of the status of all content, whether it’s life, being reviewed or a draft. From a blog post to product pages and other website pages, it allows you to assign tasks and check whether they have been done. Also, it makes it easy to integrate planned content with a complete marketing plan so that everyone knows what’s happening when. When something is to be changed on a website, it literally gives companies a tremor, as without CMS it just means having to trawl through hundreds of pages, making changes on each one. But with CMS, the underlying architecture remains the same and changes can be done easily, without breaking the site. In fact, a CMS with advanced features keeps itself up to date automatically. Similar to the functional changes on a website, it is mandatory for the companies to make timely changes in the design of a website not only to keep it updated but also to break the monotony of look and feel. In this respect CMS comes rather friendly. Simply because the content and design are kept in separate virtual boxes, so that the changes can be made in design while keeping the site functional. Another commendable aspect of CMS is the ability to make a change in the administrative dashboard and have it automatically propagated to the entire site. This advantage allows the website to have a consistent appearance and to add a mobile interface to your site. This may seem superfluous to mention but for some businesses like that of online news and magazine, content management is not just about publishing content and forget about it, but it is about being able to remove it when it’s out of date. With CMS this is as simple as un-publishing the content – all menus and links update automatically, so that the customers continue to have a good experience of the site. Also, if configured, CMS allows you to include customized content such as calendars and lists. Needless to say anything more about the role and importance of CMS in current web scenario or to say Internet of Things. However it is wise to consider two factors before an organization decides to invest in a CMS. First, an organization's size and geographic dispersion, especially if an organization has a global spread. As this makes it difficult for them to transition to CMS. Secondly, the diversity of the electronic data forms used within an organization must be considered. If an organization uses text documents, graphics, video, audio, and diagrams to convey information, the content will be more difficult to manage. Nevertheless, nothing can overshadow the kind of advantages CMS brings to an organization’s website and the way it easily allows even the non-technical users to maintain the website in an effective manner.